Since falling in love with Susan May Warren’s writing, I was thrilled to find my library had some of her Deep Haven novels. 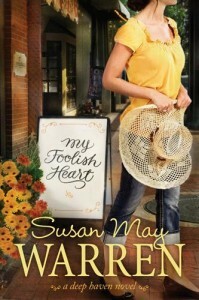 My Foolish Heart, showcases Susan’s talent at pulling off four points of view. The main character is Isadora (Izzy) Prseley who suffers from panic attacks after watching her mother die in her arms after a terrible car accident three years prior that also left her dad in a care facility with a trach and paralyzed. Izzy has developed agoraphobia, and is terrified to even go to the grocery store, much less drive her car to visit her father. She has managed to maintain a career as a talk show host of a lovelorn program in which she is known as My Faithful Heart. Caleb Knight had dreams of coaching football, but a stint in Iraq cost him his leg and left him scarred with burns. He snags a teaching and coaching job in Deep Haven and moves next door to the most beautiful girl. Unfortunately, she doesn’t seem to like him much. Struggling to figure out what to do he stumbles upon a talk show and asks for advice as Boy Next Door. Little does he know that My Faithful Heart is the woman he is pining after. A challenge for the role of coaching leads Caleb to hide his prosthesis because he doesn’t want a job out of pity. He wants to earn it. He also wants to help his lovely neighbor overcome her fears, if she will only let him close to her. A mangy mutt bounces between both their homes giving them reasons to connect. Izzy finds herself attracted to her next door neighbor while at the same time falling in love with The Boy Next Door who is calling her show, having private discussions with her on-line and boosting her ratings all the while highlighting to her the life she had dreamed of but could never have. This is a complex novel with Seb and Lucy playing a counterpoint to the relationship with Izzy and Caleb. Seb is vying for Caleb’s job but has a history with Lucy who happens to be Izzy’s best friend. As the scrimmage comes closer things heat up in Deep Haven. Will they find love or will all be lost? This was an enjoyable story that moves along at a good pace and watching the relationships of four people is fascinating. Susan pulls it off with aplomb while challenging each character in their relationship with God. A delightful story. I’m looking forward to the next one! ← That’s it, I Quit!